I’ll be honest, we don’t make it down to Claremont, NH all that often, and a lot of restaurants tend to open and close there, especially since Claremont doesn’t exactly have the best reputation for food. But there is one place that’s been there over a year, and we continue to keep hearing good things about it: New Socials Bar and Grill. So when we found ourselves home on a Saturday with nothing in the fridge, we decided that finally gave us some motivation to go check them out. 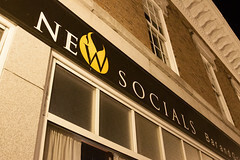 New Socials is located right in central Claremont, at 2 Pleasant Street. I guess I’m officially an old-timer around here when I can say that I remember the two previous restaurants in this space: Dusty’s Cafe where I saw the Columbia shuttle accident on the TV (Dusty’s has since moved south on Pleasant Street several blocks), and Sophie and Zeke’s (which was quite good, but closed shortly after I visited). It’s actually a pretty nice little spot since Sophie and Zeke’s fixed it up, and New Socials has put a little more shine on the location. Menu-wise, New Socials is basically “upscale American” food, with burgers, sandwiches, steaks, seafood, and pasta dishes. On our visit, however, it was Saturday night, which is Pasta Night: $14.99 for rolls, salad, and a trip to their pasta bar. The pasta bar consists of several choices of pasta, vegetables, meats, and a rather good array of sauces, and they cook it up to order. And that sounded like a good deal, so we went for it. 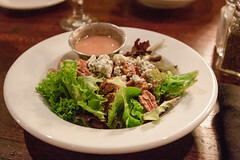 For my salad, I opted for their “Napa Valley salad” with mixed greens, dried cranberries, candied pecans, blue cheese crumbles, and a light raspberry vinaigrette. This was quite a pleasant salad, with good greens, a nice dressing, and, particularly, the candied pecans were made to order, which was a nice touch. For the pasta bar, I opted for fettucini, chicken, spinach, and sundried tomatoes tossed in a garlic alfredo sauce, and the results were pleasant enough. 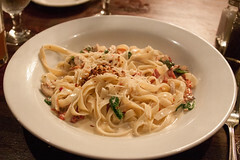 They pre-make most of the ingredients, but do a good job with them: they only parcooked the pasta and finish it in the sauce, they are constantly running fresh grilled chicken out from the kitchen, and they’ve made several base sauces to build upon to make about a dozen sauce combinations. Cooked to order, this was actually quite pleasant, and we’ll probably come do this again. We ended up rather liking New Socials. Is it haute cuisine? No. But it’s a very nicely done restaurant, and far and away the best dining option in Claremont, serving that niche quite well. It’s rather hard to provide good food in Claremont without pricing yourself out of the market, but New Socials delivers a good balance.